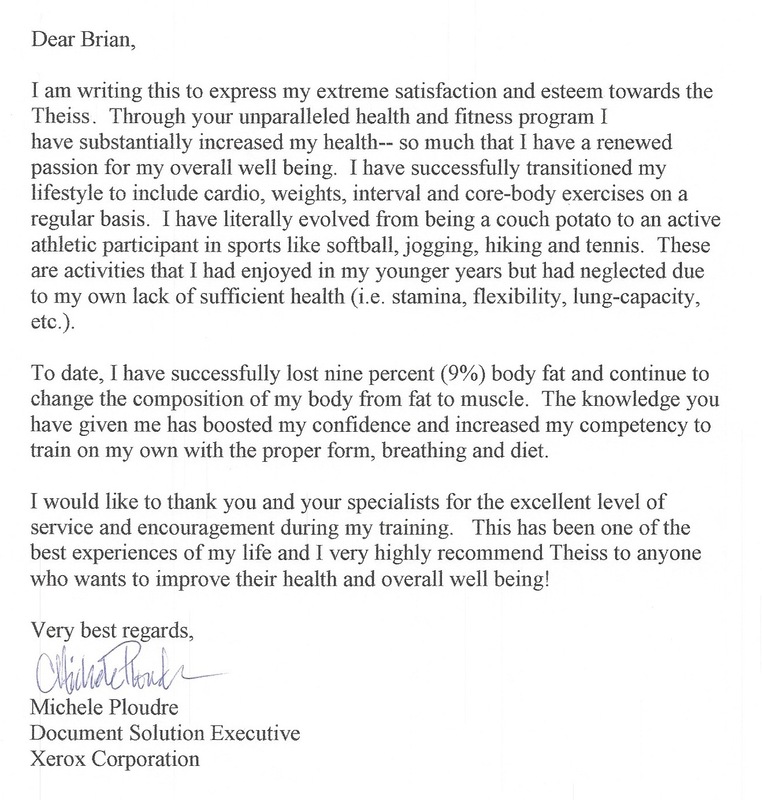 I am writing this to express my extreme satisfaction and esteem towards the TheissCare training program. 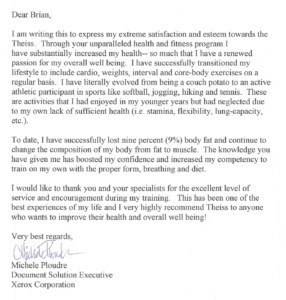 Through your unparalleled health and fitness program I have substantially increased my health so much that I have a renewed passion for my overall well being. I have successfully transitioned my lifestyle to include cardio, weights, interval and core-body exercises on a regular basis. I have literally evolved from being a couch potato to an active athletic participant in sports like softball, jogging, hiking and tennis. These are activities that I had enjoyed in my younger years but had neglected due to my own lack of sufficient health (i.e. stamina, flexibility, lung-capacity, etc). To date, I have successfully lost nine percent (9%) body fat and continue to change the composition of my body from fat to muscle. The knowledge you have given me has boosted my confidence and increased my competency to train on my own with the proper form, breathing and diet. I would like to thank you and your specialists for the excellent level of service and encouragement during my training. This has been one of the best experiences of my life and I very highly recommend TheissCare to anyone who wants to improve their health and overall well being!